Particularly with iOS 8 and OS X Yosemite set to make all your Apple devices work together better than ever, it’s important to have a neat way of keeping your iPhone, iPad and Mac in close proximity. 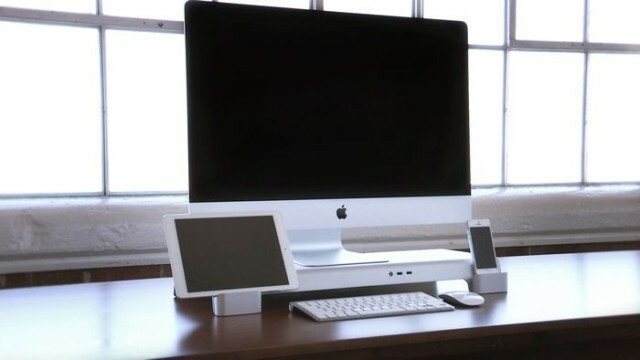 Looking to solve the problem of messy desktops, a new Kickstarter project aims to create the first all-in-one stand for Apple devices — featuring integrated dock and charging system for your mobile and tablet devices. The so-called Uniti stand raises up your Mac monitor, which also opens up space underneath the stand for tucking away your keyboard, mouse, and any other accessories. The smart stand includes two built-in USB 3.0 ports, as well as a front 3.5mm audio jack, which can be connected without the hassle of you learning over your Mac. The Uniti additionally features a universal charging system, which lets users connect virtually any device to the stand to get a battery boost. The whole solution is beautifully machined using “aircraft-grade” aluminium, and is manufactured in the U.S. of A, to boot. At time of writing, this particular Kickstarter has proven very popular, with $29,790 pledged of its $45,000 goal — and 21 days still to go. The stand will go on sale later this year, but those pledging at least $159 can pick up the desk organizer with included charging dock and cable adapter ahead of the crowd. It’s certainly an attractive solution to a problem a lot of people have, so if you’re interested in finding out more check out the below link for more info.